The bright, vivid green of Chrysophrase is almost too much to believe, but it’s real and natural, forming in ribbons of apple-green not far below the surface of the Earth. Read about how eons of rainfall helped Chrysophrase to form, and why it is known as a stone of the heart. Chrysoprase owes its name to the Greek words chrysos, meaning “gold”, and prason, meaning “leek”, an obvious reference to its bright and translucent green colour. Chrysoprase is a variety of Chalcedony, a member of the quartz family. Chalcedonies are microcrystalline quartzes, meaning that they are composed of very fine crystals arranged in a pattern that doesn’t repeat itself for a long enough distance to be seen as distinct crystals under normal magnification or by the naked eye. The colour of chrysoprase results from the presence of nickel in its structure. It forms through a process known as lateritization, a gradual weathering of rocks through heavy rainfall, which causes soluble elements in the rock to dissolve whilst the insoluble elements are slowly washed down through the weathering rock to settle and concentrate in veins and nodules. In chrysoprase’s case, serpentine and other ultramafic (low silica content) rocks rich in magnesite are subjected to the lateritization process. The insoluble silica and nickel settle together where other elements such as magnesite have dissolved, to form veins of green chrysoprase. The highest quality gem-grade chrysoprase is a semi-transparent, glowing, apple green colour. It is often mistaken for high quality jadeite and has been marketed in China as Australian Imperial Jade, a bit of a twist on the truth. Chrysoprase can be found in various shades of green, from pale to dark, and may be either translucent or opaque. As the material is often pock-marked with little cavities, it is difficult to find a flawless stone. When exposed to sunlight or heat the colour of chrysoprase may fade and the stone loses its translucency and lustre. This is the result of dehydration. Chrysoprase contains a silicate in its structure called pimelite, which readily traps water when exposed to moisture, or conversely releases water in dry conditions. To restore colour, stones can be immersed in water or wrapped in wet towels. chrysoprase, although both minerals are borne from the same material. Lemon chrysoprase is a magnesite (magnesium carbonate), which is produced by the hydrothermal leaching of magnesium from serpentine. Though magnesite is of itself white, the presence of nickel causes the green to yellow colour. Chrysoprase is recorded in history as far back as 23 A.D. The Egyptians made beads and other jewellery and the Greeks and Romans carved cameos and signets from it. In Europe it was first mined commercially in 1740 in Poland and was in very high demand until the mines were exhausted and the price became prohibitive. Prussian king Frederick the Great was particularly enamoured with chrysoprase and used it extensively to decorate his palace and other important buildings around Prague. He also wore it as a ring, and a knob of chrysoprase adorned his walking stick. In the Book of Revelations (21:20) chrysoprase is mentioned as the tenth of twelve stones that make up the foundations of the wall surrounding the “New Jerusalem”. In the Middle Ages thieves held a piece of chrysoprase in their mouths in the belief that it would render them invisible. The Ancient Romans attributed to chrysoprase the power to enable communication with lizards. Soothing and emotionally uplifting, chrysoprase is a stone of balance. It is considered a youthful stone, imparting and promoting a youthful spirit. It encourages a connection with nature and appreciation for the Earth’s natural beauty. Chrysoprase is very much a heart stone. It opens, balances and energises the heart chakra and helps one to be centred in the heart at all times. It is attributed with helping to heal “broken hearts” and aiding one in recovering emotionally from abuse, clearing the way for new relationships. In current relationships, chrysoprase may help to identify disruptive patterns, thus providing the space required for healing and reconciliation. It promotes compassion, acceptance and forgiveness. Chrysoprase is said to attract new friends to the wearer. Placed on the solar plexus, chrysoprase assists in releasing emotional stress and tension. As the solar plexus is the seat of the will, chrysoprase empowers the heart to harness the will to manifest the heart’s desire. Lemon chrysoprase is said to induce deep meditative states and encourage a sense of being a part of the Divine All. It energizes both the heart and base chakras and is said to attract positive energy and lift depression. 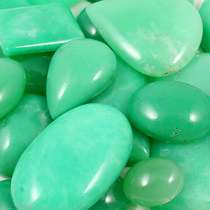 As a physical healing stone, chrysoprase’s principal role is to help one accept healing energies. It can be used to prepare one to be open to the healing properties of other crystals. As much as it is beneficial to the heart emotionally, chrysoprase is also credited with strengthening the heart physically and is said to help relieve heart disorders. It is also said to relieve gout, increase fertility treat eye disorders. It is even documented in the 11th Century Byzantine manuscript of Michael Psellius that it strengthens vision and relieves pain. Chrysoprase relates to the astrological sign of Libra and vibrates to the number 3.